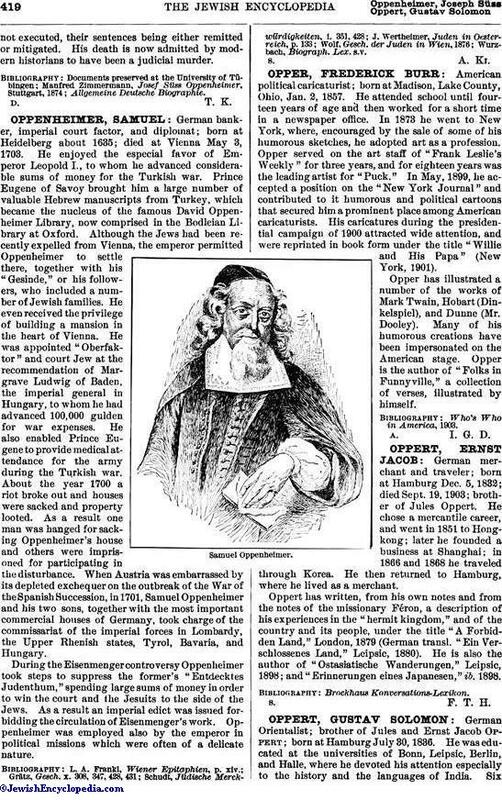 German Orientalist; brother of Jules and Ernst Jacob Oppert; born at Hamburg July 30, 1836. He was educated at the universities of Bonn, Leipsic, Berlin, and Halle, where he devoted his attention especially to the history and the languages of India. Sixyears after receiving the degree of doctor of philosophy, in 1860, he went to Oxford as assistant librarian at the Bodleian, and in the same year he became assistant librarian to the queen at Windsor. He left England in 1872 to accept the professorship of Sanskrit in the Presidency College, Madras, which chair he held until 1893, when he resigned, and, after a tour of northern India, China, Japan, and America, returned to Europe in 1894. Settling in Berlin, he became privat-docent in Dravidian languages at the university. Oppert's work began with "Der Presbyter Johannes in Sage und Geschichte" (Berlin, 1864; 2d ed. 1870). He wrote also "On the Classification of Languages" (London, 1879) and "On the Weapons, Army Organization, and Political Maxims of the Ancient Hindoos" (Madras, 1880), as well as "Original Inhabitants of Baratavarṣa or India" (Westminster, 1893). In 1895 appeared his "Reise nach Kulu im Himalaya," and in 1903 "Tharshish und Ophir." From 1878 to 1882 Oppert was editor of the "Madras Journal of Literature and Science." Oppert's first Sanskrit work was his "Lists of Sanskrit Manuscripts in Private Libraries of Southern India" (2 vols., Madras, 1880-85). His "Contributions to the History of Southern India" (part i., ib. 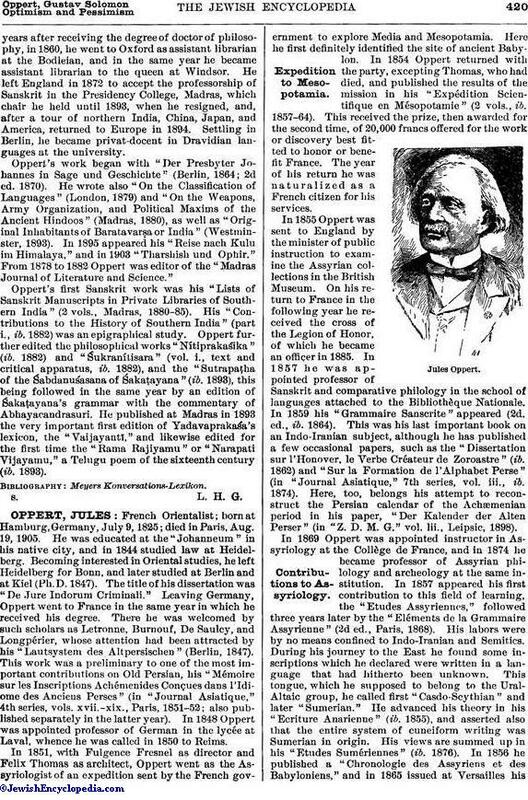 1882) was an epigraphical study. Oppert further edited the philosophical works "Nítiprakaśika" (ib. 1882) and "Śukranítisara" (vol. i., text and critical apparatus, ib. 1882), and the "Sutrapaṭha of the Śabdanuśasana of Śakaṭayana" (ib. 1893), this being followed in the same year by an edition of Śakaṭayana's grammar with the commentary of Abhayacandrasuri. He published at Madras in 1893 the very important first edition of Yadavaprakaśa's lexicon, the "Vaijayanti," and likewise edited for the first time the "Rama Rajiyamu" or "Narapati Vijayamu," a Telugu poem of the sixteenth century (ib. 1893).